Introductory remarks on cartilages, bones and on "Bone: formation by autoinduction"
Introductory remarks on cartilages, on bones and on: "Bone formation by autoinduction." A prologue is an explanatory and introductory discourse, which in this case should then commence by asking "Why did I become interested in sharks, sharks' cartilages, sharks' teeth and evolution?" Back at the University of the Witwatersrand, Johannesburg, I went to the library of the Medical School where, with difficulties, I started to manually sieve through the Index Books then printed and made available world-wide by the National Library of Medicine of the National Institutes of Health (NIH) in Bethesda, Maryland USA. The essay "How to swim with sharks: A primer" further sparked my interest in shark biology, leading to my reading classic papers on the cartilaginous fishes and discovering that shark genera and species are fully evolved animals with superb differentiating pathways 3-5 that make the shark the most effective killer swimming in the waters of our planet. Sharks or Selachians are named Chon-drichthyes, fishes with an endoskeleton of cartilage thus including the jaws and the chondrocrania (a cartilaginous box containing the spinal nervous tissue of the shark). This has obviously changed our understanding of the evolutionary skeletogenesis in animals up the vertebrate mammals. It is worth nothing then as Romer stated " that instead of beginning with a purely cartilaginous skeleton, and later gradually acquiring bone, the early vertebrates had a considerable degree of ossification which was followed in a majority of cases by a slump toward a cartilaginous condition"6Romer further stated that "Bone is an ancient, rather than a relatively new, skeletal material in the history of vertebrates"
In mammals, the majority of the bones of the skeleton arise from a cartilage anlage that serves as a strut for the induction of bone formation, undergoing vascular invasion with capillary sprouting into the hypertrophic cartilage. This vascular invasion brings about chondrolysis, i.e. the death of the cartilage anlage, and the differentiation of the first waves of osteoblast-like cells. These differentiated cells lay down the early bone matrix, later to be mineralized to form the long bones of the mammalian skeleton (Fig. 1). The Feature Paper which follows describes our understanding of these evolutionary "de-differentiating" events from a bony to a cartilaginous endoskeleton invocating evolutionary speciation highly favorable to degenerate the bony endoskeleton thus blocking the induction of bone formation and skeletogenesis. These "de-differentiating" events in selachians returning to cartilaginous endoskeletons have set evolutionary specificity that resulted in more resilient animals, with higher capacities to float, more favorable to deep immersions and feeding into the oceans without breaking a bony endoskeleton. De-differentiation from a bony to a cartilaginous, or predominantly cartilaginous, endoskeleton in Elasmobranchs might have occurred following natural evolutionary selection resulting in the speciating of selected gene clusters encoding powerful inhibitors of angiogenesis. 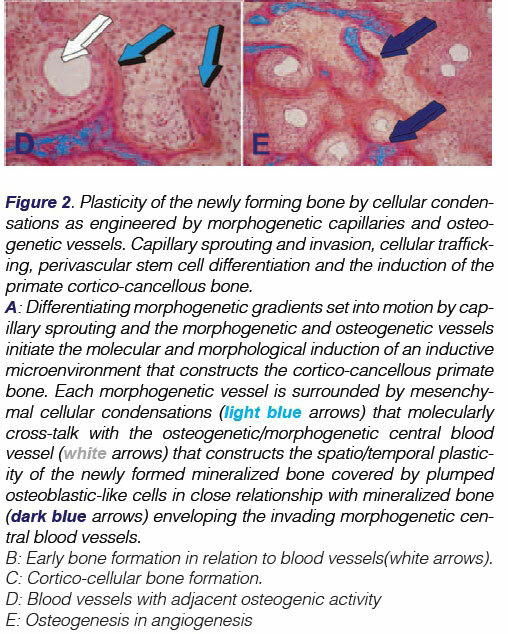 Cartilaginous matrices contain powerful morphogenetic signals that inhibit angiogenesis and capillary sprouting.21,22 Shark cartilages contain a substance that strongly inhibits the growth of new vessels which may well explain the rarity of malignant tumours in Elasmobranchs,23,2* and potentially could be used to inhibit tumour angiogenesis in humans. Evolutionary pressure for superior habitats for feeding in the deeper waters of the oceans might have set in motion genetic mutations leading to the expression of several powerful inhibitors of angiogenesis, thus blocking the induction of bone formation. 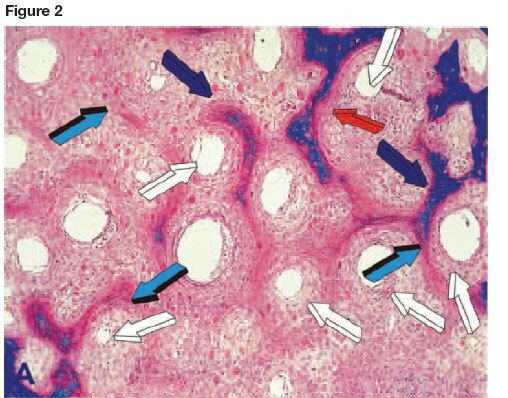 The molecular and cellular cascades of osteogenesis via an en-dochondral pathway, as seen in mammals and in teleost fishes (those having an endoskeleton of bone) have been blocked in the shark by the inhibitors of angiogenesis which have been found in extant shark cartilage. On consideration, there is an intriguing possibility that it may be possible to "reactivate" the osteogenic pathways in the shark. What biological mechanisms could be involved? *A chaotropic agent is a molecule in water solution that can disrupt the hydrogen bonding network between water molecules (i.e. exerts chaotropic activity). In this context, the question was then formulated whether the bone morphogenetic proteins would have the capacity to "force" endochondral bone formation and/or direct intramembranous bone formation by inducing bone in heterotopic intramuscular sites of cartilaginous Selachian recipients. At the laboratories of the then Dental Research Institute in Johannesburg Laura Yeates and I undertook the attempt at the extraction process from cartilage taken from the large shark Carchari-nus taurus, using techniques we had learnt when studying the purification of naturally-derived bone morphogenetic proteins from bovine bones.28 Laura, already attached to the embryonic and emerging Bone Research Laboratory within the Dental Research Institute of the University, was confronted by the ultra-viscous extracted material overly rich in high molecular weight mu-co-polysaccarides that characterized the cartilaginous extracts. Several attempts to extract and purify the shark proteins resulted in partially purified morphogenetic factors. After our success with the baboon proteins, we thought to again try to extract and purify proteins from Selachian cartilages, but using different chromatographic procedures. The samples had been flown with Laura and carried in her hand luggage from Africa to Washington DC. 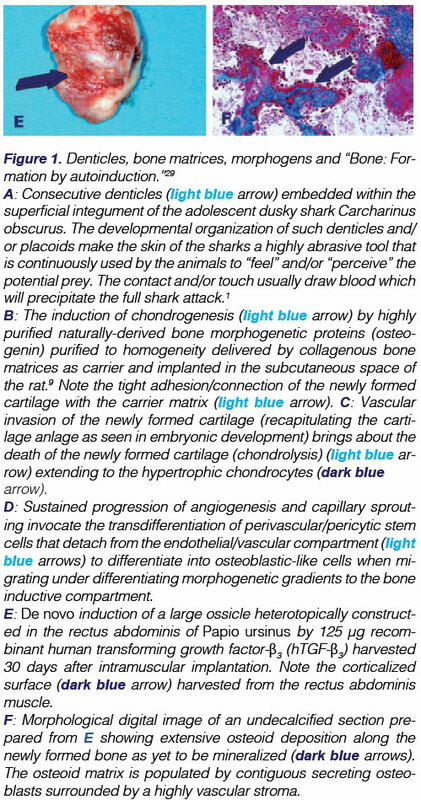 The extracted morphogenetic factors were later implanted in the subcutaneous space of rodents and uniquely and provocatively also implanted into the muscle of adolescent dusky sharks Carcharinus obscurus in a series of in vivo experiments in the salty water ponds of the Oceanographic Research Institute, Marine Parade, Durban, under the blue skies of the subtropical African sun. It is the intention of the following Feature Paper to describe the extraction and purification of Selachian's cartilages and the implantation of the extracted morphogenetic factors both in rodents and in Carcharinus obscurus sharks at the Oceanographic Research Institute in Durban. 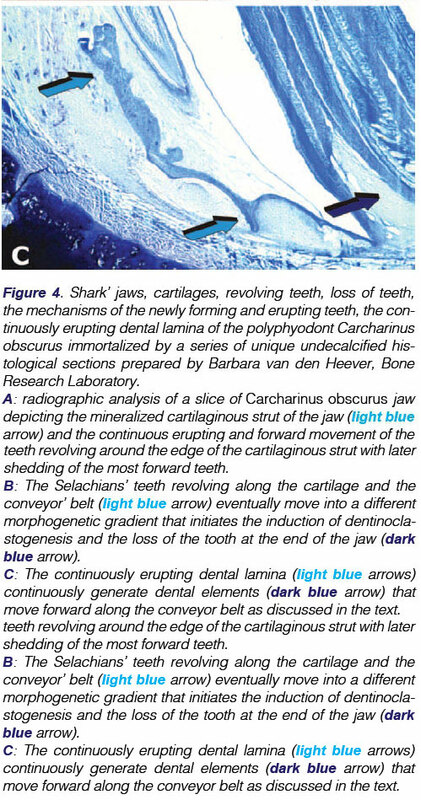 The manuscript also details the attachment apparatus of the connective tissue matrix to dentine or dentine/ like material of the multiple shark teeth and describes the forward movement and migration of the Selachian's teeth by a mechanism of a conveyor belt of condensed mesenchymal cells packed with fine connective tissue fibres that by tractional forces between cells and secreted matrix must move the rows of teeth forward until their exfoliation. The Feature Paper additionally highlights the fact that the loss of teeth is physiologic in sharks but pathologic in mammals, and that tooth shedding in Selachian fishes is the conditio sine qua non for the ancestral evolutionary predatory habit of the sharks amidst the richly populated waters of our oceans. We show that the implantation of coral-derived macroporous bio-reactors induce the differentiation of chondroblastic tissue and the differentiation of cartilage within the macroporous spaces, indicating the lack of an overt osteogenetic programme within the DNA of the Selachian cartilage. We further propose that the lack of the induction of bone formation in Selachian intramuscular sites is the result of deficient angiogen-esis and vascular invasion in the Selachian cartilages because of the overtly rich anti-angiogenic factors within the cartilaginous matrices21-24 which block "osteogenesis in angiogenesis".